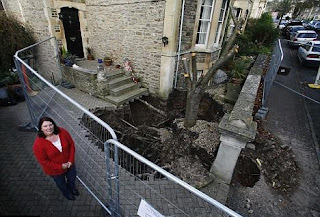 A family has abandoned its Victorian home after a tiny hole in the driveway opened up into a 20ft crater - which swallowed their entire front garden. Housewife Dawn Hides, 46, was about to take her 17-year-old daughter Alice to college when she noticed two paving stones missing from her front drive. But as she walked towards the tiny hole to investigate the ground gave way beneath her feet and she fell into a huge chasm. 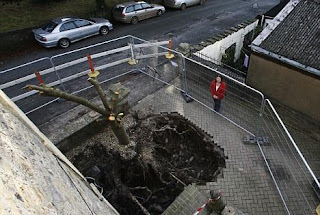 Husband Nick, also 46, was woken by the sound of falling masonry and rushed outside to help Dawn, who escaped from the hole with only cuts and bruises. But over the following week their driveway and garden slowly slipped into the crater and they were forced to abandon the £350,000 home. It is believed the cavern is an old cellar or water storage tank, which will now have to be filled in with concrete. 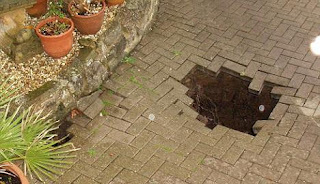 Mum-of-three Dawn, of Clevedon, Somerset, said: 'As I came out of the front door I noticed two of the paving bricks had gone. 'Then, before I knew it, I was in a hole up to my shoulders and I couldn't get out as every time I tried to grab hold of something more of the driveway kept sliding away. 'Luckily I only got a few cuts and bruises. The hole was originally just the size of my body but since then it's got bigger and bigger. 'We've had to stay in a hotel because cracks have started appearing in our front room. Dawn and her engineer husband Nick, who moved into the house 12 years ago, have had no problems with the driveway until it caved in at 7.30am on Monday. But as the hole widened cracks started to appear in their front room and they were forced to move into a local hotel. Experts have since found a brick archway around 10ft (3m) underground, suggesting it was cellar or water storage tank. They now plan to make the house safe by underpinning its foundations and filling in the 20ft by 20ft hole with concrete. The building work will be covered by their insurance but the Hides do not know if they will be back in time for Christmas. Ironically, Nick had booked a week off work to carry out renovations on their property when the massive crater appeared before he could begin. He said: 'The main thing is that Dawn was okay and we somehow managed to get the car off the driveway without that being lost down the hole.' Local historian Jane Lilly said Hides' house was built in the early Victorian era and believes their driveway has subsided into a water storage tank. She said: 'Houses built along that road date back to the early 1860s, which comes only a few years after mains water was laid in 1856. 'But for most people there was a transition period and the archway seems to be good evidence of a traditional brick-lined storage tank for rain water.